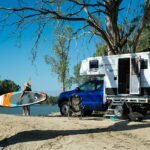 Winnebago, under the supervision of Apollo Motorhome Holidays in Australia, has been kicking a lot of goals lately. 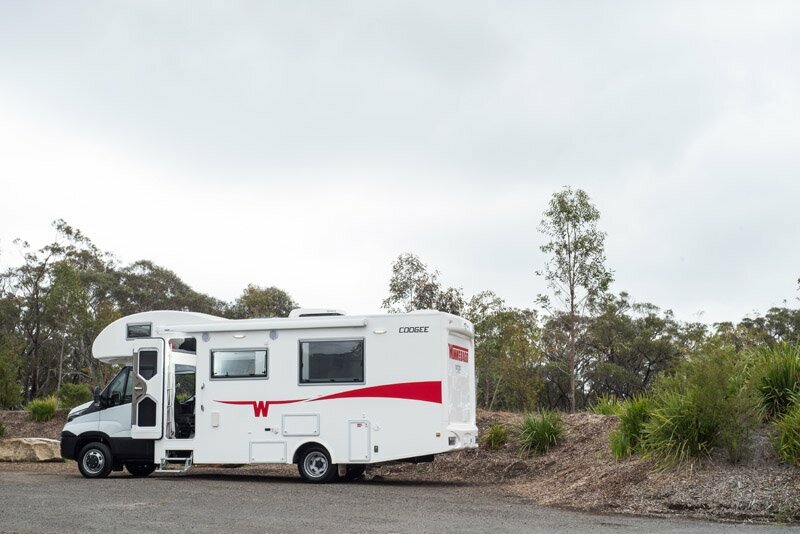 It’s listed itself on the Australian stock exchange, bought a large share of peer-to-peer caravan hire business, Camplify, bought one of Sydney’s largest RV dealerships and still managed to continually update its growing range of motorhomes. 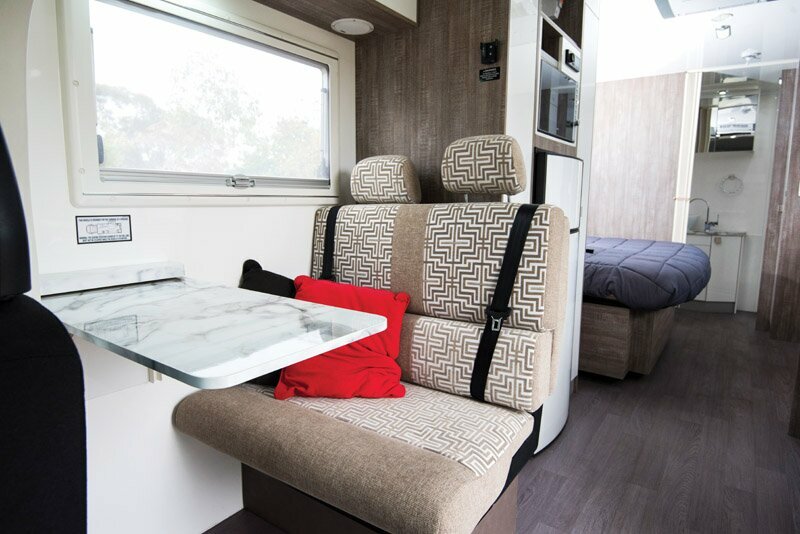 The Coogee is a great example of what Winnebago is capable of. It’s a good looking motorhome with plenty of room, nice aesthetics and plonked on a great cab, that being the Iveco Daily 50C17. There’s even a slide-out section for the bed, plus one of the best rear ensuites I’ve come across in a motorhome. The 3.0-litre four-cylinder turbo diesel is capable of 125kW and 130Nm of torque – roughly equivalent to the power of many modern dual cab utes, which means it’s got plenty of grunt to help move it along, even up long stretches of road, or into stiff headwinds. I take it over the Blue Mountains on our test, and it easily maintains its road-speed up the long steep section from Penrith to Glenbrook. The power delivery is exceptionally smooth, too. 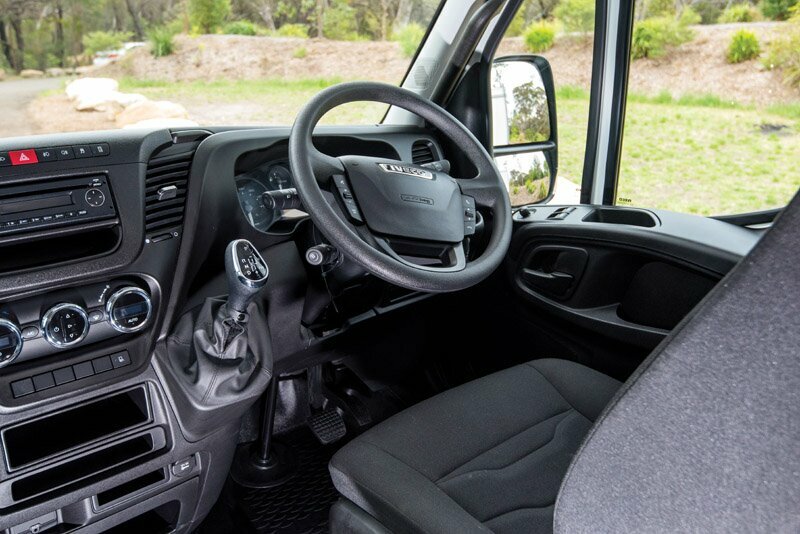 In the last update of the Daily, Iveco introduced a spectacular eight-speed automatic transmission which has brought the light truck to the front of the pack in terms of refinement. It’s easily on par with the sophistication of the Mercedes-Benz Sprinter seven-speed, and worlds better than the underwhelming Comfortmatic transmission in the Fiat Ducato. A few small things let the Daily’s cabin refinement down, though. The media player is basic, and some of the functions are hard to use. It is Bluetooth compatible, though, so you can connect your phone to it for calls and music. The swivelling driver’s front seat also closely resembles a blacksmith’s puzzle to operate – to spin it round you’ve got to negotiate it past the steering wheel and handbrake, which requires a number of different adjustments at different stages. Both the Ducato and Sprinter are slightly better in both those areas. The motorhome conversion is top-notch, though. 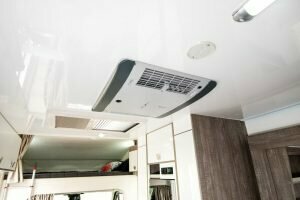 The Apollo group has one of the most professional production lines in the industry and a lot of skill building tough-as-nails motorhomes and campers for a hire fleet, so transferring that and adding some flair to the Winnebago motorhomes hasn’t been an issue for the Queensland company. This is a floorplan that prioritises open spaces and storage. There’s heaps of both. The slide-out bed takes care of the latter, as it gives the Coogee a queen-sized island bed, oriented east-west. This in turn allows the van to have a full-width rear ensuite and leaves more space for the kitchen to spread out. The kitchen isn’t left wanting, either. It’s standard with a 190-litre three-way fridge/freezer, three burner stove and a full-oven. Included is a microwave, range hood and 14-litre gas electric hot water system. Under the bench is a slide-out pantry, and opposite, next to the fridge is a roof-height storage cupboard which would make an excellent pantry. On the other side of the fridge is roof-height hanging space with two levels. Forward of that is the motorhome’s small dinette. There are two options here – either forward facing seats with lap-sash belts or a side-facing seat with two lap belts. There’s a small table, and the ability to swivel the front seats to add lounging options. I’d like to see Winnebago expand this space, though – as it would be a tight squeeze for more than two people (there are beds for four). If the hanging space next to the fridge was moved backwards and next to the ensuite, the dinette could be shuffled back a foot, the seatback could be reclined a little and the table made bigger. I also found the table to be a little high for comfortable eating. 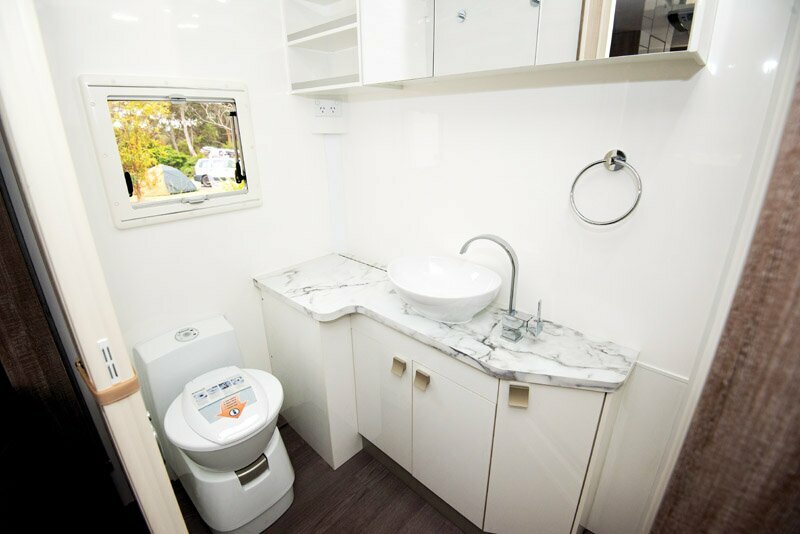 Right at the back, the ensuite is great because it’s big and open. It’s the oft unspoken things that make it good, too – not feeling cramped while sitting on the toilet, or having room to move around while in the shower. 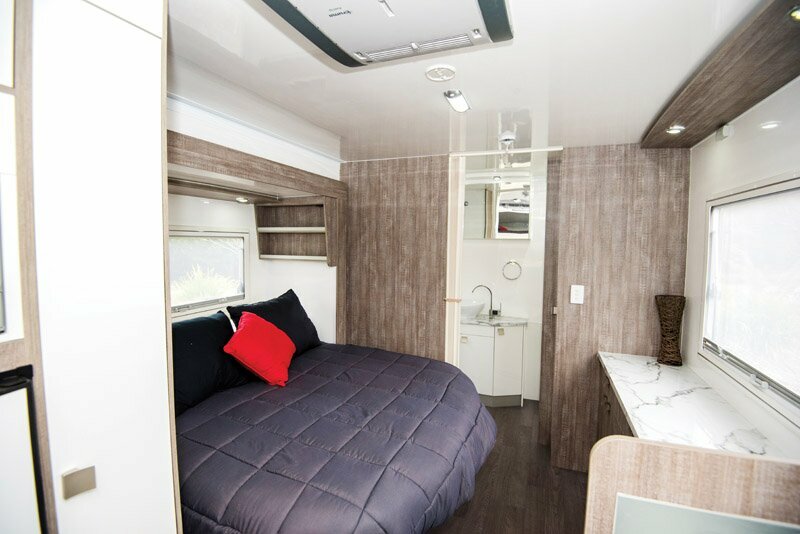 It includes space for the optional 2.5-litre top-loader washing machine, a countertop basin, mirrored overhead cupboards, and a roof-height linen press which I’d probably use for clothes storage because it’s the most convenient storage space in the motorhome. There’s even more good storage at the foot of the bed. Three drawers for undies, and a group of cupboards underneath, two of which are also accessible from the outside thanks to a boot hatch. There are also some handy shelves for him and her at the bed-head, both of which have a pair of USB power points. 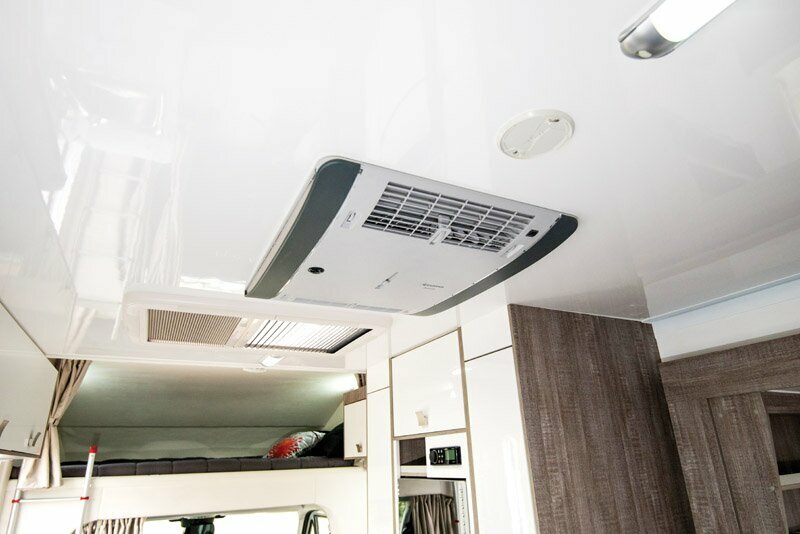 In fact, there are at least nine USB charging points throughout the RV, which are so much more useful than 240V power points (although there are plenty of those, too). There are a couple of other things that I really like about this van, too. The main door opens further than 90 degrees, so doesn’t stick out into the awning area. There’s an external shower on the back which makes washing things down nice and easy. It’s also got a very ordered electrical system with an easy to use central control system. Having said all that, the Coogee isn’t the motorhome for me. 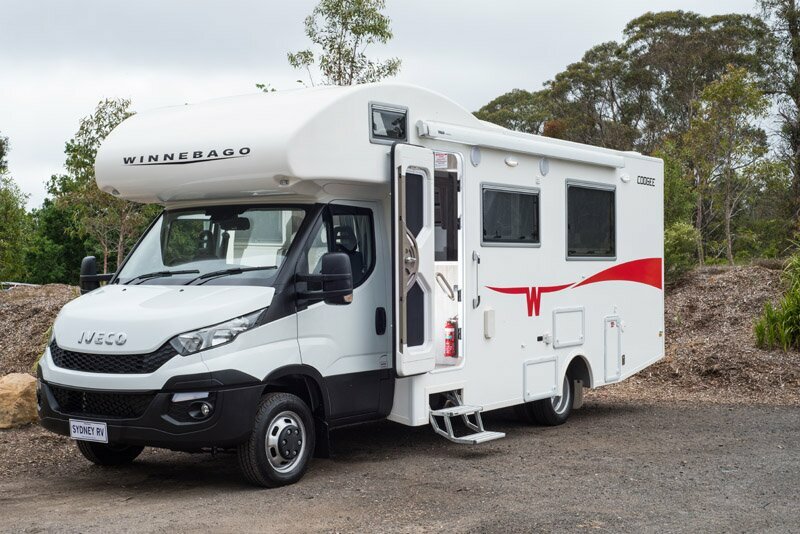 I’d much prefer something like the Winnebago Kirra, another one of Winnie’s Iveco based motorhomes. 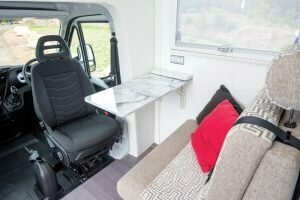 It’s built to the same level of quality, has a bigger dinette (two of them actually), even if it sacrifices a lot of the storage space (especially for things like clothes). Still, if you spend most of your time dining outside, want one of the most comfortable sleeping arrangements on the market and love a big ensuite – the Coogee is hard to argue with. 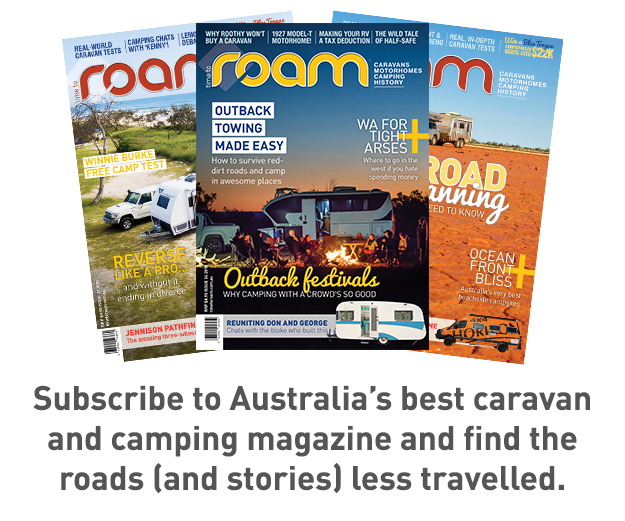 This article originally appeared in issue 29 of ROAM – subscribe to get the latest issue delivered to your door.